General Motors, also referred to as GM, currently produces vehicles in 10 different makes. These makes include Chevrolet, Buick, Cadillac and the now discontinued Pontiac brand. GM is known to share vehicle platforms and components across the different makes. Due to the shared engineering across the General Motors Company, the new Spectre Performance Air Filter, number HPR9492, will replace the stock paper filter inside the air filter box of a large number of Chevrolet, Buick, Pontiac, and Cadillac models from 2005 to 2012. Spectre High Performance Replacement air filter HPR9492, is specifically designed to outperform an ordinary paper filter by providing increased airflow for improved performance. Spectre HPR stock replacement performance air filters are manufactured to fit perfectly in your factory air filter box and use high quality materials throughout including a pre-dyed synthetic filter media that will not fade, top quality urethane, and steel mesh. Spectre High Performance Replacement air filters are pre-oiled and ready to use. The HPR9492 stock replacement air filter from Spectre Performance is an easy to install performance improvement for select 2005-2012 Chevrolet, Buick, Pontiac and Cadillac models. Owners of these GM cars and cross-over SUVs can rest assured knowing that Spectre Performance warrants all products to be free from any workmanship and material defects with a limited 90 day warranty. By simply replacing your ordinary paper air filter with the HPR9492 performance air filter from Spectre, select 2005-2012 Chevrolet, Buick, Pontiac and Cadillac models can receive increased airflow and performance. 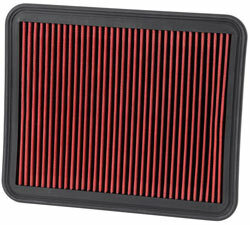 Please click here to view the detailed list of vehicles this performance air filter will fit. Browse all Spectre automotive products by category at SpectrePerformance.com. While you are there use the Products by Vehicle Search to find other Spectre performance products specifically made for your vehicle. Spectre Performance products can be purchased through local auto parts retailers, to find the nearest Spectre Performance dealer use the Spectre Dealer Locator. Since 1983 Spectre Performance has designed and offered unique, innovative, parts and components to fuel your car or truck obsession. Whether your fixation happens to be a GM car or cross-over SUV, Spectre will help fuel your passion for performance.